Ice crew volunteer Steve Hayward. For most of the season the pond at the Alton Mill lies cloaked in winter drab. The dry leaves of summer’s bulrushes shiver and rattle, the frosty wind eddies across the ice, and the snow collects in windrows like frozen waves on a beach. But on one Saturday every January the pond is awash in bright colours, its ice scratched by the blades of a hundred skates, and its shoreline bustling with a cheering crowd. 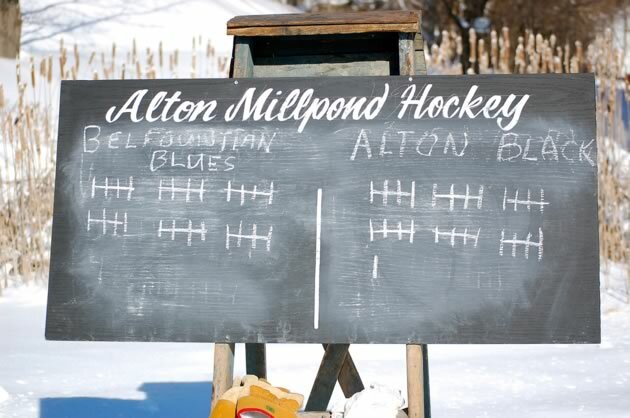 That’s the day of the Alton Millpond Hockey Classic. In fact, this day begins long before January. The planning committee starts meeting in the fall. Then, when conditions are right, a volunteer shovel brigade clears the ice surface, taking care to avoid slushy spots among the rushes. 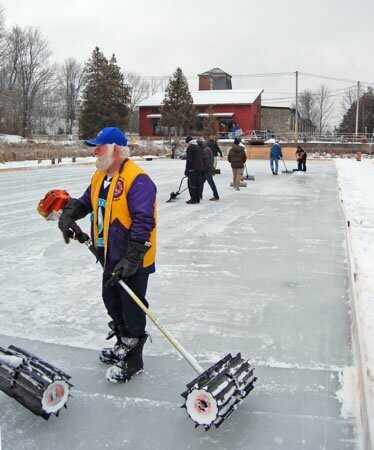 Once the batter boards are hammered into place around the perimeter of the rink, folks from the Alton fire station add the finishing touches, flooding the ice in hopes of creating a surface somewhat smoother than what nature provides. All that hard work pays off. 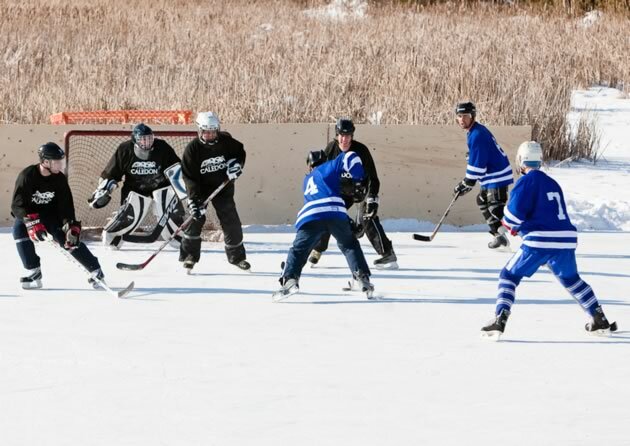 The event got its start when Alton Mill co-owner Jeremy Grant and Doug Beffort, a municipal councillor for the area, put their heads together and came up with the idea of holding a hockey tournament on the pond. 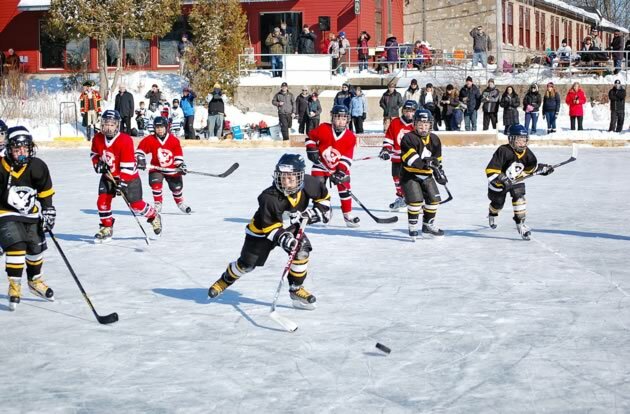 Since then, the hockey classic has become a celebration of all the best about winter in the hills. 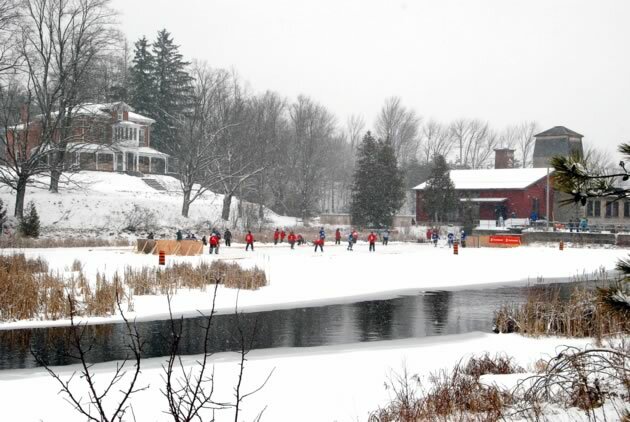 The historic photo of Alton showing skaters on the pond ( far right) that inspired the Alton Millpond Hockey Classic. Click to see larger version. 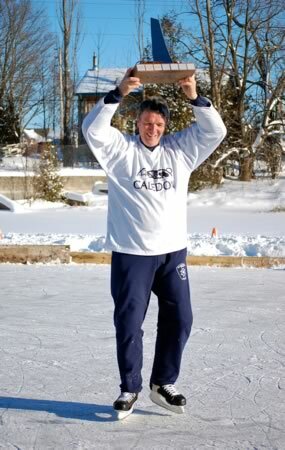 Caledon Village Quarrymen captain Jake Haines proudly holds aloft the 2013 Millpond Cup. The trophy was designed by Alton artist Barry Metson. 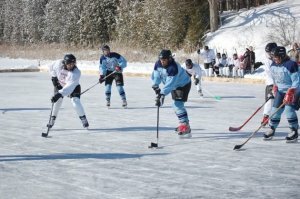 For the first Alton Millpond Hockey Tournament in 2010, two men’s teams competed for the Millpond Cup, a creation of Alton artist Barry Metson. The Caledon Notables, a ragtag group from around the area, defeated the Alton Firefighters to win the cup and bragging rights. 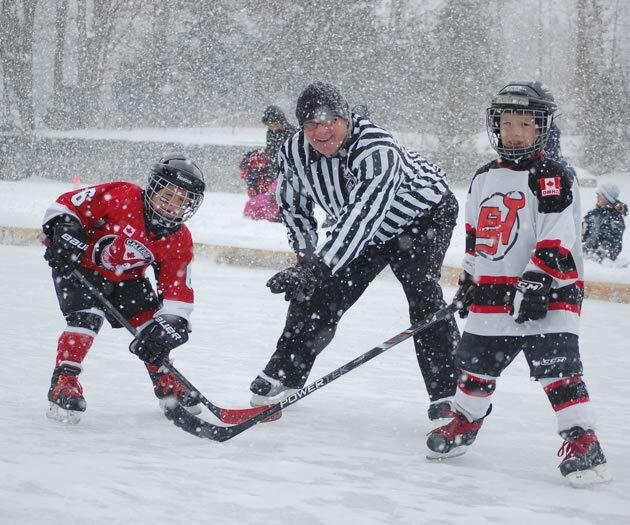 In the years since, the name of the event has changed to the Alton Millpond Hockey Classic, the format has expanded to include women’s and kids’ teams and some of the rules have been tweaked. Men’s teams, for instance, must include one guy in his 30s and two in their 40s, with no limit on the number in their 50s and older. 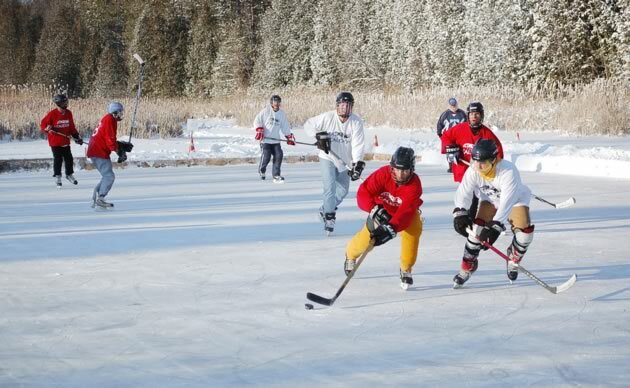 Even bigger changes are expected this year, as The Millcroft Inn has offered its pond for the event as well, so even more players and teams can participate. As it is for many who join the festivities, the day is a “real family affair” for Kim Carrigan, who is also on the planning committee. In 2014, she played on the Group Therapy team, made up of local women who play in a few fundraising tournaments every winter. Perhaps in a nod to the evening’s activities, the image on their hockey shirts includes a wine glass. 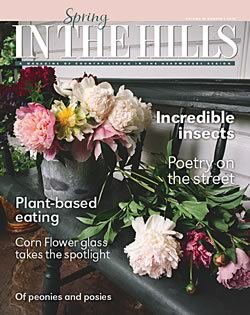 For the classic, Kim said, “We split the group into two squads – black shirts versus white shirts.” Kim played in the women’s game, one of her daughters sang the national anthem and “The Hockey Song” with the Alton Public School choir, and her other daughter played on the Atom girls’ hockey team. Her husband helped shovel and tied skates. In 2013, Alton women’s team Group Therapy (in white) matched skills against the women’s team from Inglewood (in blue). Photo by Joanne Crease. The score matters in only one game, when the Millpond Cup is up for grabs. There’s even a professional official on the ice – former NHL linesman Ray Scapinello is a Hockey Hall of Famer who holds the record for the longest on-ice career of anyone in the league. “Scampy” dons his striped shirt every year, though he rarely assesses penalties. One of his most important duties is to carry a bucket of pucks to replace the ones that get lost in the snowdrifts that surround the rink. Young players joined in the tournament for the first time in 2013. Photo by Joanne Crease. “It’s exhilarating,” said Janice, “being out in the cold, fresh Canadian winter air, passing the puck. Actually,” she laughed, “the ice is so rough it’s hard to get the puck across the ice, so the game slows down to our level. It’s a lovely day, a real family event. Nothing feels any more Canadian than standing beside a frozen pond singing “O Canada” and “The Good Old Hockey Game” with neighbours and friends, then watching a game on the big screen.” The big-screen game is shown in the evening at the Hot Stove Lounge Pub Night, a popular feature that was a sellout last year. 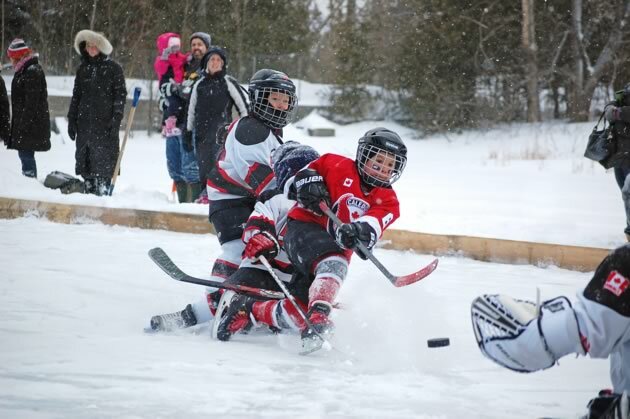 Gabriele Cashera, a Caledon Hawks Tyke, got off a shot last year that would make any coach proud. 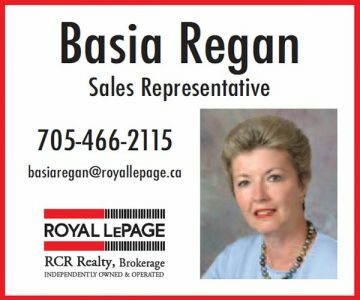 In addition to bringing together the Caledon community, the event is a fundraiser for the Alton Millpond Rehabilitation Project. Players pay a registration fee to enter, and spectators are encouraged to throw change into buckets. Proceeds from ticket sales for the pub night and from auctions and draws also add to the fund. Damming the creek to create the pond that powered the mill resulted in a “bathtub effect” that raised the temperature of the water in the pond, he added. These warmer temperatures have adversely affected the population of brook trout, a coldwater species native to the creek. The rehabilitation plans include modifying the dam to create a passageway where fish can follow their natural migration routes. 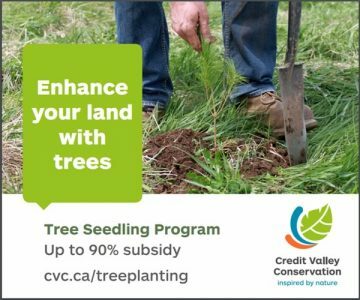 In addition, an offline pond will allow colder water to flow through while maintaining the pond for future generations. 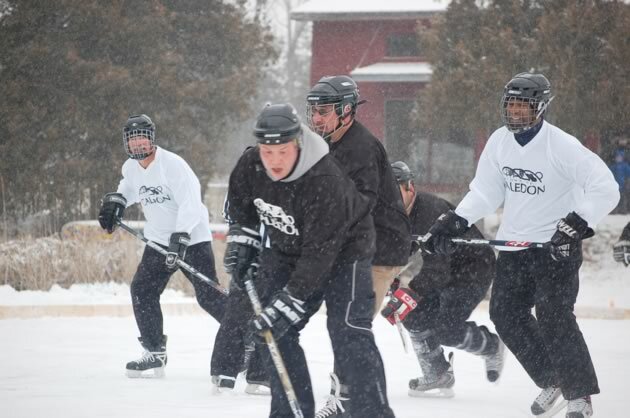 This is Jeremy’s dream for the future, but right now he is gearing up for the sixth annual Alton Millpond Hockey Classic. 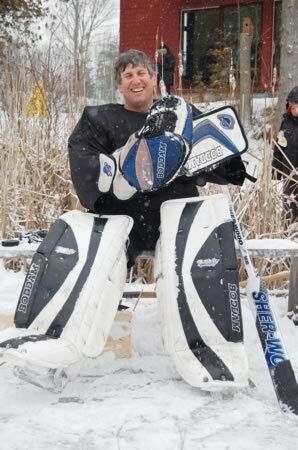 On Saturday, January 24, hockey enthusiasts from Caledon and beyond will get together once again for a day at the Alton millpond. A choir will lead the crowd in singing “O Canada” and “The Hockey Song,” and the pucks will drop for a few games of shinny in the wintry Canadian air. 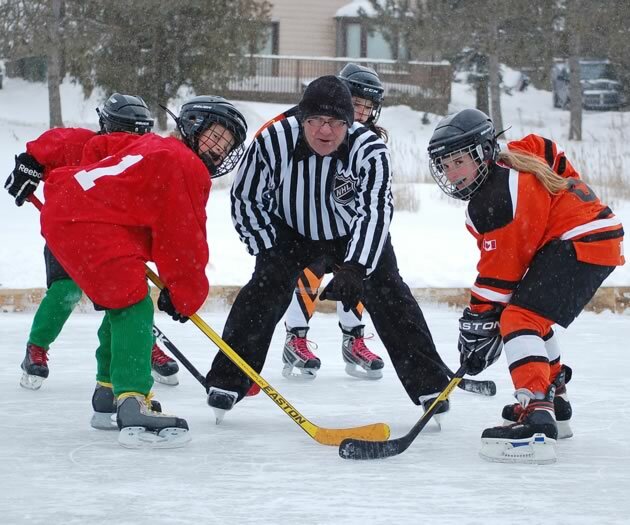 NHL Hall of Fame linesman Ray “Scampy” Scapinello drops the puck for Alton’s Daniel Adams and Emily Smith, who plays for the Girls Atom Orangeville Tigers, during a 2014 shinny match. The Alton Millpond Hockey Classic runs concurrently with Fire & Ice, an annual winter festival of “flames, food and fine art” hosted by the Alton Mill Arts Centre and featuring a weekend of indoor and outdoor activities for the whole family. To find out more about the hockey classic and reserve tickets for the popular Hot Stove Lounge Pub Night, go to altonmillpondhockey.ca. 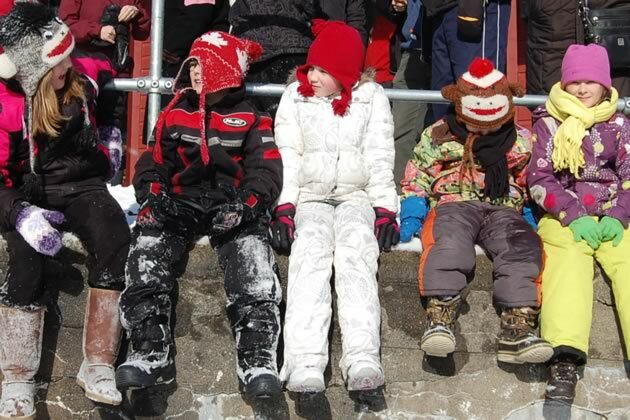 Information about Fire & Ice is available at altonmill.ca.